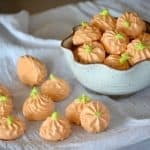 Pumpkin Spice Meringue Pumpkins – flavored with the great taste of Fall, this colorful treat will please both kids and adults. 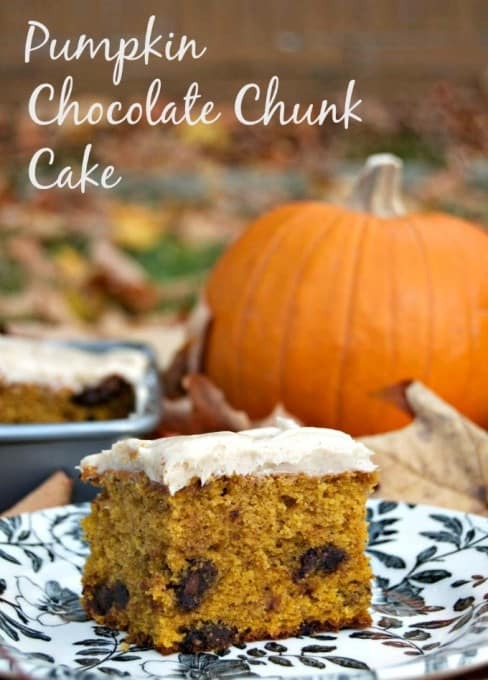 They’ll be the perfect addition to your Halloween or Thanksgiving dessert tables! This week has been AH-mazing. I think it’s just what the doctor ordered. A week in Kauai with some old and new blogger friends, sunshine, beautiful beaches and very friendly islanders sure does have a way of picking up one’s spirits and calming the soul all at the same time. We’ve done so much while we’ve been here, too – trips to beaches, of course, absolutely delicious dinners with incredible ocean views, enjoyed shave ice, a boat tour, luau and more. I’ll definitely be posting about it in the upcoming weeks, so be on the lookout for it. There are also a couple of recipes I hope to recreate as well. With it already being the middle of September, Fall is sure to be in the air in certain parts of the country. And this time of year has me yearning for New England, the change of seasons, apple and pumpkin picking and most of all, the Fall foliage. 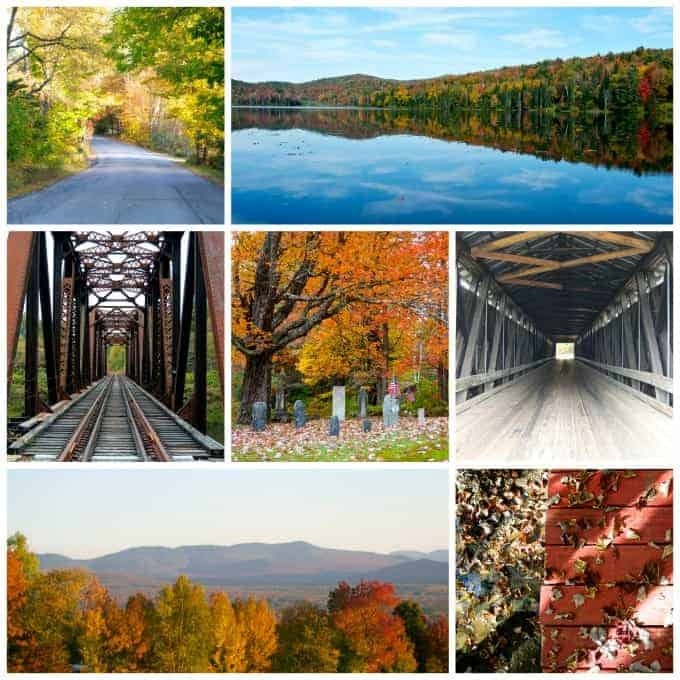 When we lived in New Hampshire, we were definitely spoiled and I would love to see those brilliant colors again soon. 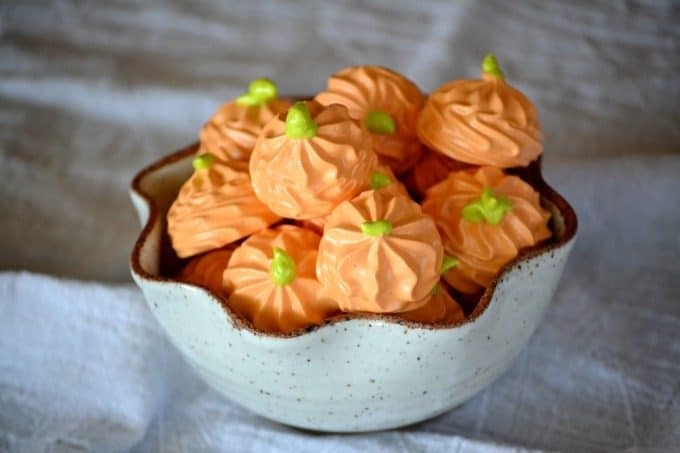 Until then, I’ll be eating these pumpkin meringues. They’re a tasty little treat and are really fun as well. 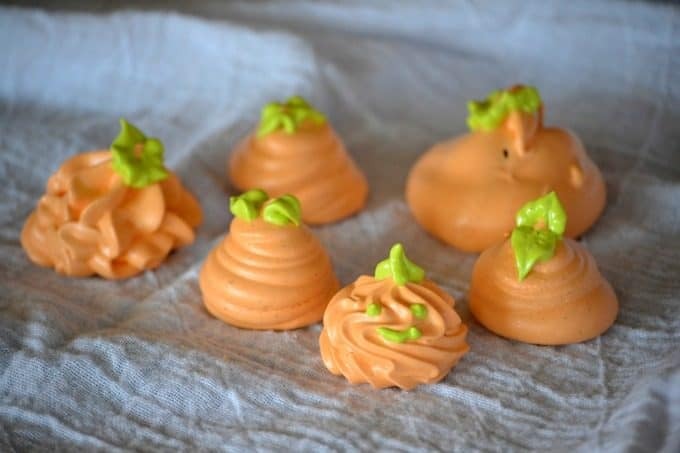 They’re going to be adorable on a dessert table along with these Super Cute Halloween Party Food Ideas I found over at Spaceships and Laser Beams! It wasn’t easy making them into the shape of a pumpkin and I suppose I could’ve tried harder if I’d really wanted to. As you can see I did give it a go with a few different tips before finally settling on what I thought looked the best even though it wasn’t true to life. I don’t have a complete set of decorating tips, so just went with what I had. Please feel free to use whichever tip you think might work best. 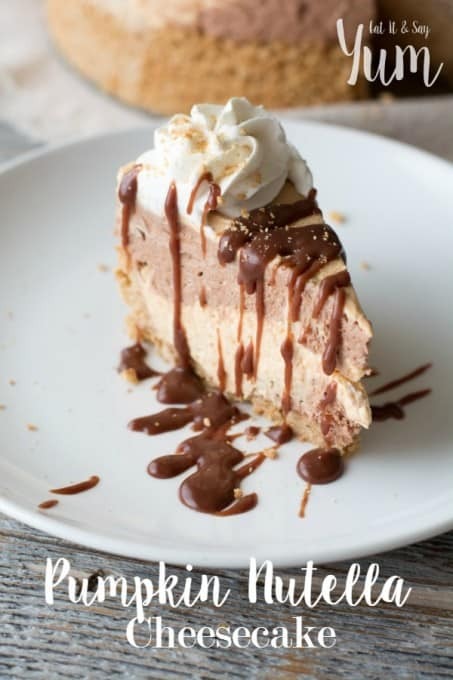 I’d love to see pictures of your finished product, so use the hashtag #365daysofbakingand more when using social media or share them on the 365 Days of Baking Facebook page! 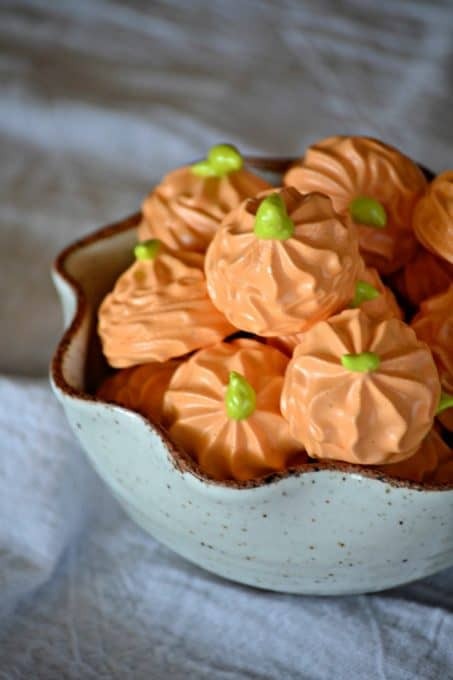 Pumpkin Spice Meringue Pumpkins - flavored with the great taste of Fall, this colorful treat will please both kids and adults. 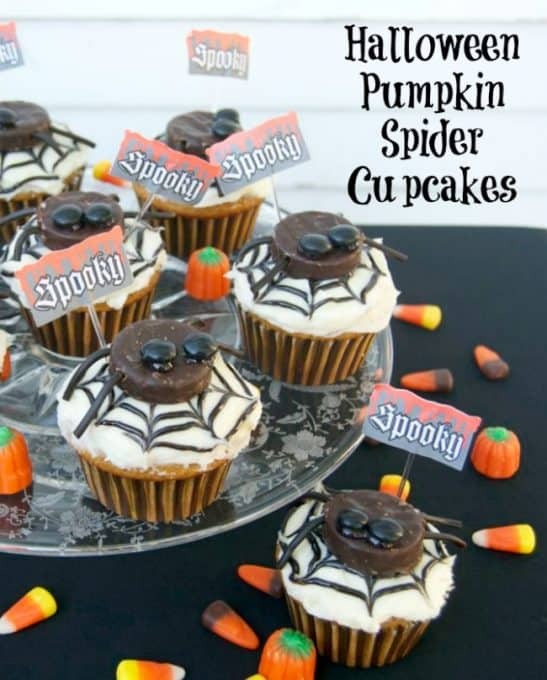 They’ll be the perfect addition to your Halloween or Thanksgiving dessert tables! Preheat your oven to 175 degrees F. and prepare a baking sheet by lining it with parchment. In a medium bowl over a pot with an inch of simmering water, combine the egg whites, sugar and cream of tartar. Whisk constantly for (7 minutes) until sugar is completely dissolved. You’ll be able to tell when you rub a little of the contents between your thumb and finger and it doesn’t feel granular. Gently pour the mixture into a mixing bowl. Add the vanilla and pumpkin pie spice. With a whisk attachment or a hand beater, beat on low, gradually increasing to high for (7 minutes) until stiff, shiny peaks are formed. Place 2/3 cup of the meringue into a mixing bowl and color with green food coloring until desired hue is reached, mixing with a rubber spatula. Pour the desired amount of orange food coloring into the contents of the mixing bowl and beat until well mixed. 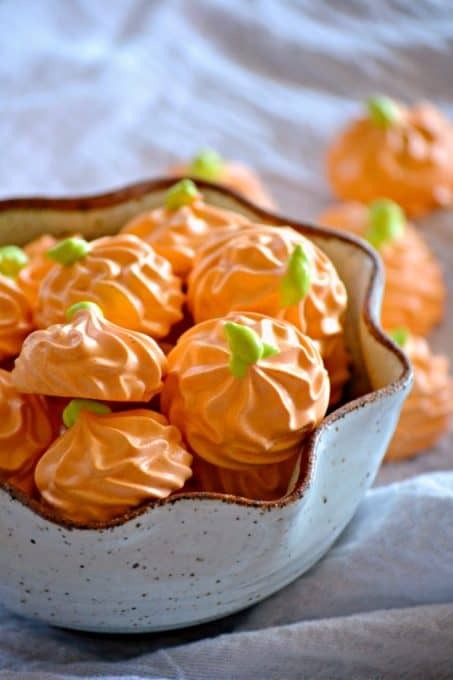 Place the orange meringue into a piping bag fitted with the #22 tip. 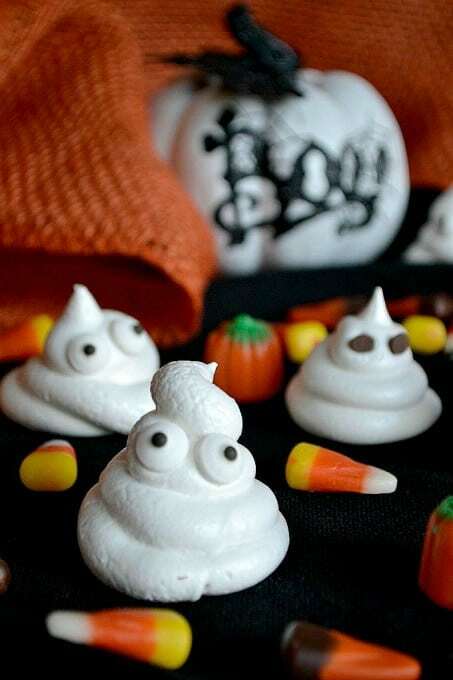 Create the pumpkins by piping in one place on the parchment and pull up. The meringues will not spread, so can be placed about 1-inch or so apart on the baking sheet. Place 1/3 of the green food coloring into a piping bag fitted with the Wilton #1 tip to add the stem. Do so by piping a small amount on the top of the pumpkin and pulling over. Place the remaining 1/3 cup of the green food coloring into the piping bag fitted with the Wilton Tip #67 and pipe a leaf or leaves onto each pumpkin. Turn oven off and allow the pumpkins to remain in the oven for an additional 4 hours to set. Store covered in an airtight container for up to 4 days. These Pumpkin Pies are gorgeous! Watch these videos to learn how to make a great one! *This post contains an affiliate link(s). These are links that can take you to a product (or products) that I recommend. I do receive a portion of the sales or credit for my future purchases from any items purchased through those links. Your purchases encourage my baking, cooking and butter habit, and contribute to the life of this blog. I thank you so very much for your support. Let’s keep having fun in the kitchen!! Sorry about that, Nancy. I don’t know what the issue would be. Try this link and scroll down towards the bottom of the page.Hope it helps!